Exciting news! For me at least. I decided to finally learn how to knit socks. I was so intimidated by them at first but after hearing so many people go on and on about how fun, easy, fast and enjoyable knitting socks are I just had to try it out myself. 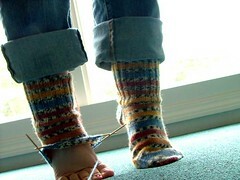 I'm using Silver's Sock Class because her instructions are SO easy and she has lots of great pictures. I was able to figure out how to do each part very quickly and effectivly! I'm thrilled! I danced around the house last week when I finished the first sock. Things like this are dangerous for me since it's more then likely that I'll forget about knitting the second sock and just move on to another pattern. Luckily I cast on for the second sock right away and now I'm SO CLOSE to finishing it. David tells me there's going to be LOTR on TV tonight so I might just finish it tonight then. Aren't they cute? I'll fill everyone in on yarn and needles when I'm fully finished, but I just have to say knitting with this yarn has been SO MUCH FUN! Watching the stripes form and appear has just been magic. I remember the fashion majors at school complaining about how tricky socks were. Yours look cutecutecute though! It was SO GOOD too and yes, I did finish the socks during it. Wooooo! Thanks puppy and OMGHAPPYBIRTHDAY to you! Hee! I knew you'd love them. What are you folks up to? I'd love to show these babies off to you in person!